Please reach out to us if you have any information to share, or would like to get involved with any of the initiatives or projects. 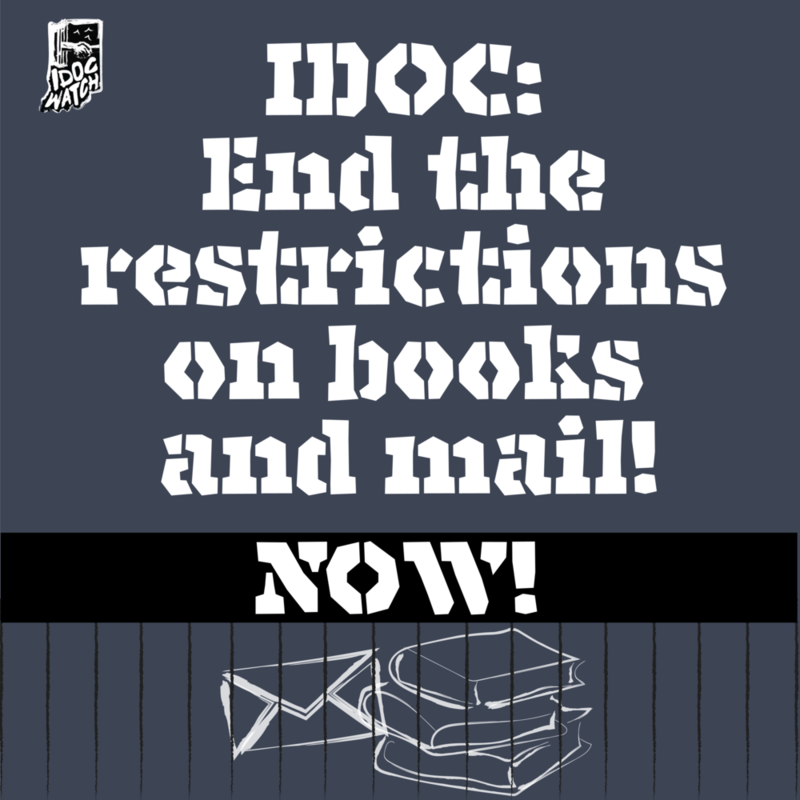 IDOC Watch understands the mail ban to be a policy which represents both the neo-colonial, anti-social repression of prisoners, as well as the neo-liberal cost-cutting pursuit by facilities and DOCs across the country. Implemented in April 2017, the ban stated that no mail can be sent into facilities in Indiana, unless they are on white lined paper in white envelopes. This ban was rationalized by the DOC as being in response to “drug trafficking,” (which we know mostly is done by the staff of facilities) despite them keeping no records or data of drug trafficking incidents in the department. The IDOC is slowly attempting to phase out contact visitation in their facilities. As with the mail and book ban, contact visits are either outright cancelled or made increasingly restrictive. Administrators regulate the amount of hugs and kisses inmates can give their loved ones while at some facilities no touching is allowed at all. This new creeping policy of non-contact subsidizes companies like Global Tel Link whose electronic tablets are being introduced in order to profit from visitation. The costs are burdensome to inmates and their families and without the ability to actually interact with their loved ones, many people choose not to visit the prisons at all. After meeting significant public and prisoner push back, Indiana State Prison and Pendleton Correctional Facility have had to roll back their bans on contact visitation but the efforts by the IDOC continue. With this project, we invite all people interested in fighting against mass incarceration, the prison-industrial complex, and policing to join us in studying and discussing the theory and history of prison abolition and struggles against the carceral system. We will make copies of the texts we're studying for that session available to people incarcerated in Indiana who work with IDOC Watch, and we'll leave hard copies at Rabble Coffee in Indianapolis to be picked up and read by people on the outside. We'll meet for a discussion of the text, and that discussion will include commentary and questions provided by our incarcerated comrades.